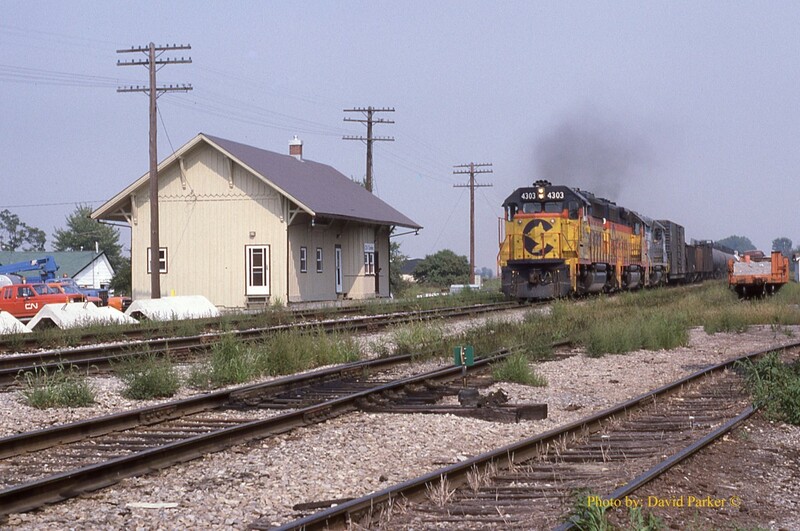 Railpictures.ca - David J Parker Photo: CSXT #321 hustles past the Ex NYC Depot at Comber, Ontario on the CN Caso Sub. | Railpictures.ca – Canadian Railway Photography – photographie ferroviaire Canadienne. Caption: CSXT #321 hustles past the Ex NYC Depot at Comber, Ontario on the CN Caso Sub. I agree. This is just another one of those timeless captures that you really cannot get tired of. It would make a great framed image for anyone’s train room. I still love this photo! Dave Thanks! Takes about a month to do the Time Machine I have a queue of time machine submissions, please give me a couple more weeks, once we moderators discuss them I have to program them into the system. Steve. I wanted to submit this to Time Machine with photo 28110. Love it. Great shot Dave. Great shot! I always liked the track layout there. Oh my!!! Isn’t that choice !! !